Nevada Southern, built by Nashville, Tenn.-based Corrections Corp. of America for $83.5 million, will look different than traditional prisons in more than just ownership. Prisoners can meet with outsiders, except lawyers, only through closed-circuit video feeds. In-person contact, in a large room or separated by heavy glass, has passed into history. Between their out-of-the-way locations, security measures, advance paperwork requirements, limited visiting hours, exorbitant phone call fees, etc., prisons can make it very hard for inmates to coordinate and receive visits from family and friends. Yet studies have consistently suggested that prisoners who receive visits and maintain family ties fare better in terms of recidivism and reentry after they return to their community (as 90% of prisoners eventually do). 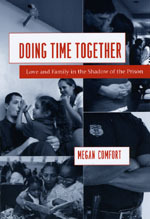 In turn, visits are also important for prisoners’ children; studies suggest “those who visit their parents more often and under better visiting conditions exhibit fewer adjustment problems” (Petersilia, When Prisoners Come Home, p. 44). Although I do not know if it’s been empirically proven, I would be surprised if a closed-circuit video visit has the same meaning to either prisoners or their visitors as a face-to-face conversation. I would assume that if pressed about this policy, CCA would say it’s about keeping out contraband and/or cutting costs. But it sounds to me like a short-sighted, counterproductive measure. The ruling by two liberal justices (Marilyn Kelly and Michael Cavanagh) and two conservative justices (Robert Young Jr. and Maura Corrigan) does more than uphold the rights of the incarcerated. It’s good news for anyone espousing so-called family values — or, for that matter, anyone who believes the courts and state bureaucracy should consider real-world problems when interpreting the law. Nearly 70% of women in state prisons have young children, and over half have never had a visit from them. Those statistics come from the Sentencing Project, which has put together some stories of how women in prison spend Mother’s Day. The video above is from the California Department of Corrections and Rehabilitation, which collaborated with the Center for Restorative Justice Works to bring over 700 children to visit their incarcerated mothers yesterday in the 11th annual Get on the Bus event. A similar event is also being planned for Father’s Day.